Take a break from seasonal chaos for some holiday fun! Break out your winter scarves and sweaters! Wine & Blooms is joining forces with the beautiful Danby Gathery to host our first Holiday Workshop Extravaganza! 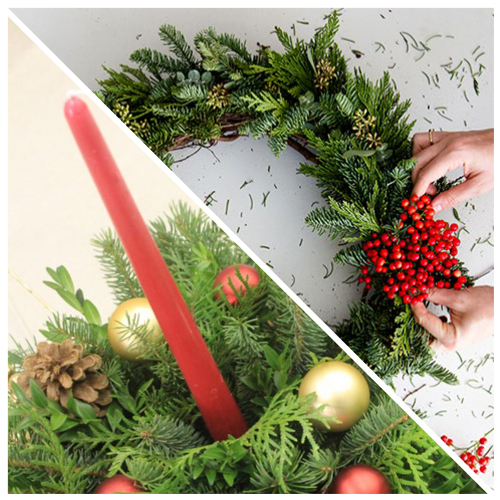 Join us in creating not one, but TWO fresh, evergreen projects, a Holiday Centerpiece and a Front Door Wreath! These would usually be offered as separate classes for $35/each, so you get $10 off just by staying for both classes! This venue does NOT have a bar, so please Bring Your Own Beverage. We will have hot cider, kettle corn and other light snacks. Please drink responsibly. Also, we want to see your silly and crafty Holiday Spirits by wearing your favorite Holiday Sweater during the Workshop! The winner will be revealed at the end of the event and will receive a Wine & Blooms Gift Certificate!